Wrigley doing a line edit from above. Eight years ago, I stopped into Food Lion to pick up some salad, veggies, and a bag of Sun Chips. I went home with two feisty kittens, still blue-eyed balls of fuzz I could fit in the palms of my hands. They had wandered over, across two parking lots from a feral colony in the bamboo behind McDonald’s to play among the potted plants at the supermarket. I caught Simon, the gray cat, easily, but Wrigley evaded capture with spitfire speed. 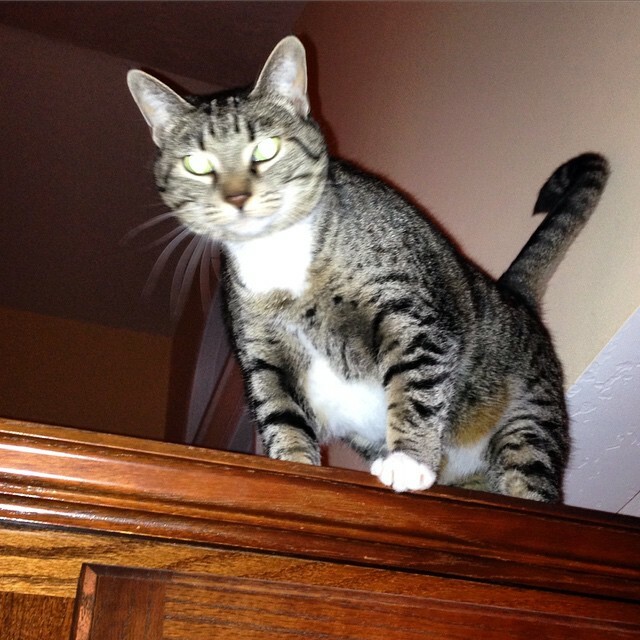 Once home, she was a hissing, spitting, swiping creature right out of a Stephen King novel. What did I get myself into? Today, lifting either cat would count as weight lifting, and each has turned into kneading, purring, head-butting lap cats. And when I’m trying to write, a lap cat that tries to occupy the same spot as the laptop makes for a creative challenge. I could shoo Wrigley away, but I’m a big sap, so many times she’ll sit half on the arm of my recliner and rest her front paws on my left arm as I type. 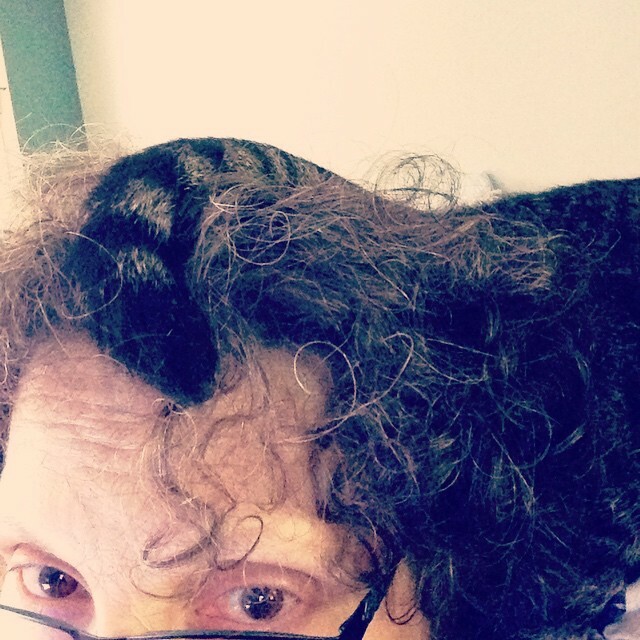 Her other favorite spot is leaning against my head on the top of the chair. Simon, not amused that not one of my characters is a cat. Simon is more assertive and doesn’t see the laptop as an obstacle, more like a warm pillow. Unlike Wriggs, he doesn’t like to hang out for long, so I usually indulge him, and I find a way to type around his rotund self. I’ve made some interesting typos thanks to Si. Yes, the kitties slow me down. Yes, they’re demanding when I need to focus. But like those sound machines that you can dial to “ocean waves” or “spring morning,” to keep you calm, Wriggs and Si are my purr machines. Their presence soothes me and makes me smile. I got Mr. Artie Dog from the Foothills Humane Society a year after the cats took over my house. When the human sits tapping furiously on the keyboard, Mr. Artie Dog keeps a low profile, usually curled up on his bed, snoring, twitching in a dream, or splayed upside down, one eye on me, waiting for the signal for bedtime snacks. He knows that signal well: the laptop screen goes black, and I pull the screen closed. Within seconds he’s off searching the house for his Kong, anticipating the treat that I’ll stuff inside the well-gnawed, red, rubber toy. Artie waiting for any sign that writing time is over. Lest you think, Artie is a slacker, he has a specific job. I’m a night owl. Whether working on a short story, or copy for work, when I get into a project, the clock ceases to exist. My eyes could be burning, my lids threatening to slam shut, and I’ll keep banging out words. There were some nights, especially when I was a freelancer, that I’d look up and it was past 3 a.m. That’s when Artie kicks into gear. As I’m telling myself, just one more sentence, I’ll feel the cold Kong hit my leg and hear it thud against the hardwood floor. Yes, my dog will throw his Kong at me, saying, “Hey! It’s quitting time!” He keeps me realistic and makes me laugh out loud. And then there was the horse. 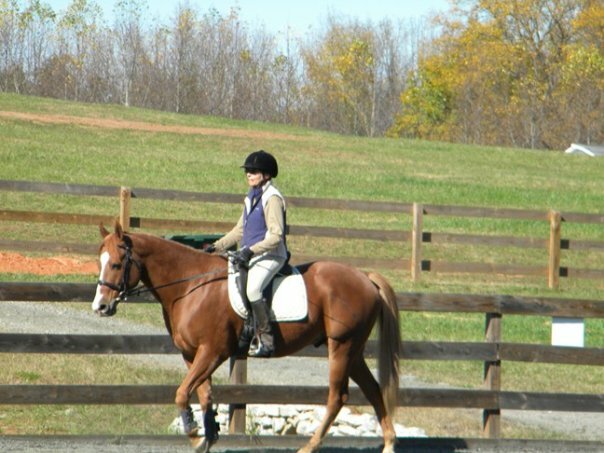 Having a horse is a time-consuming labor of love; grooming, training, riding, cleaning tack, doing barn work, and much more. Well, it’s almost 2 a.m. now. Simon is curled up at the base of a scratching post, Wrigley is sleeping on the chair above my head, and a certain dog is giving me the “time’s up” look. So I’m shutting down before I get clocked by a Kong. 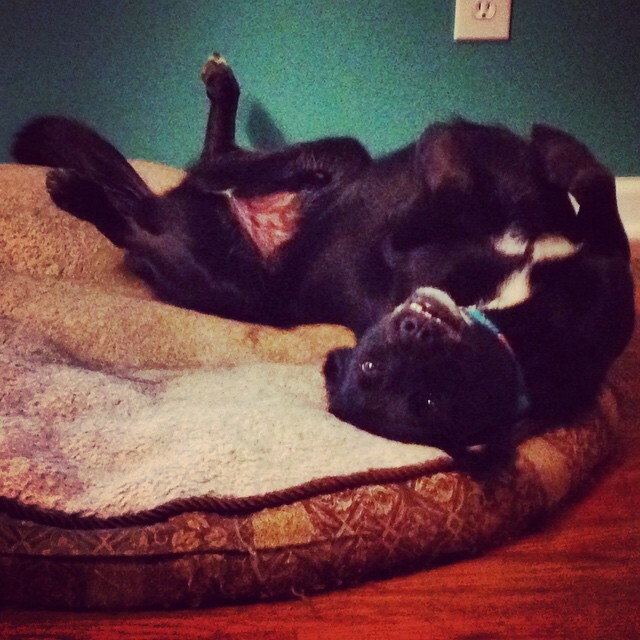 How do pets factor in your writing life? Share your critter tales in the comments. This entry was posted on July 26, 2015, 2:00 am and is filed under Darlene. You can follow any responses to this entry through RSS 2.0. You can leave a response, or trackback from your own site. I just got a cat named RJ. 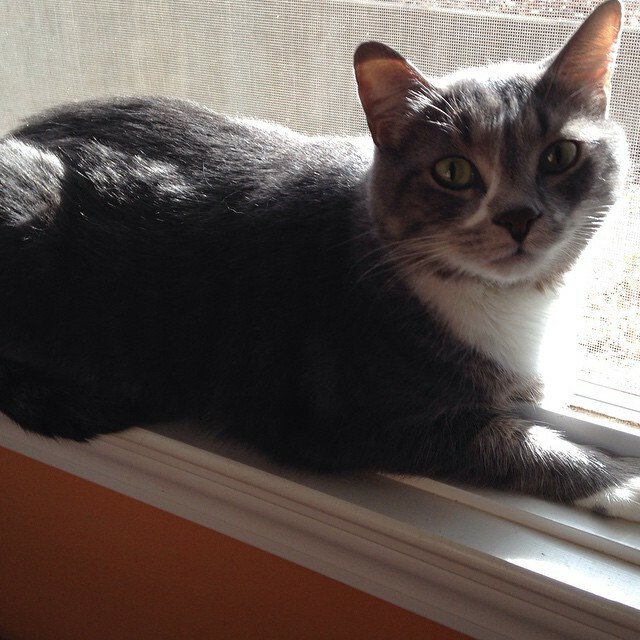 He is a gray/white tabby. When I’m on my laptop he loves to lay in between my legs and look at what i’m doing. If he sees something spectacular moving on the screen, I have to grab him so he does not dart for it, lol. RJ has helped me focus on my writing more. That is, until he falls asleep with his little paw touching my lap top. Thanks for sharing your story about your pets. I love that! I won’t tell my cats about RJ! They haven’t gone for the screen yet, and I don’t want to give them any ideas! 🙂 Thanks for reading and commenting. My corgi Grace is a welcome distraction when I’ve done all I can on a memoir I’m crafting and an inspiration for my blog–who could resist a corgi’s sweet face? Good pup! I’ll be sitting there, staring off into space, trying to figure out what I’m writing next, and I’ll look over and see Artie staring at me and just have to laugh. I love that Grace inspires you! Thanks, Beth. Nice of you to read and comment. I loved your post. Funny, it’s 2 am and I can’t sleep so I’m playing at the computer with Bebe the tabby cat lying on the floor beside me. Oops, as I wrote this, she got up and went to the kitchen. She sat here beside me quite a while because the Chihuahua Frida is asleep in the other room. I should be writing but I worked hard today. I submitted a story synopsis to the National Storytelling Festival’s story slam … one about yellow jackets, certainly not pets. The audition piece (oral) had to be a less than 2 minute synopsis. I told it in 90 seconds. Good exercise as it showed me it’s possible to tell a story in 90 seconds and get all the important things in. And Bebe’s back lying by my chair. Time to stop and pet her. Thanks, Dottie J! Sounds like your critters are quite the support team, as well. Congrats on your performances and good luck with the National Storytelling Fest!